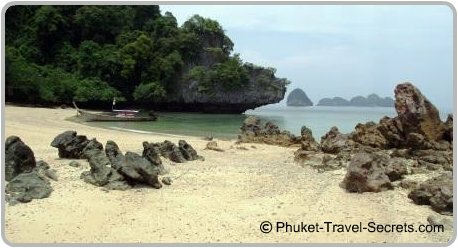 Mu Koh Hong is a group of small limestone islands located within the Than Bok Khorani National Marine Park. This group of islands is located about one hour by longtail boat north west of Krabi’s main tourist area, Ao Nang. 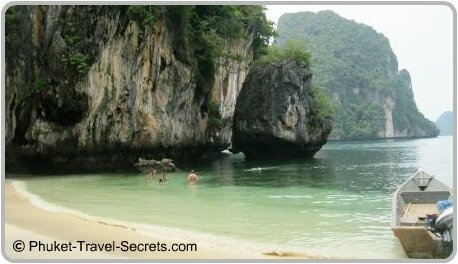 The largest island in this group of islands and the most spectacular is Koh Hong also known as Ko Lao Pile. With its picture postcard beach, towering limestone cliffs, and a secret lagoon hidden in the middle. 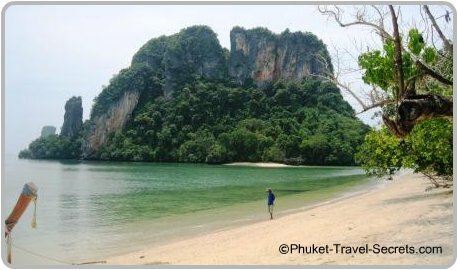 Ko Hong is one of the best day trips that should be included when planning your day trips and tours offshore of Krabi. 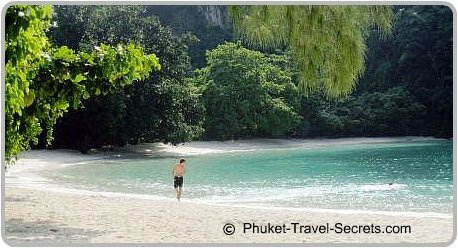 There is only one beach at Ko Hong, this stunning stretch of beach with fine white sand is called Pelay Beach and is separated into two by a massive limestone carst that sits just offshore. The southern part of the beach is where longtail boats and speed boats arrive with day trippers. The northern section of the beach is kept clear for swimming, and snorkeling and is loaded with fish that follow you through the water. 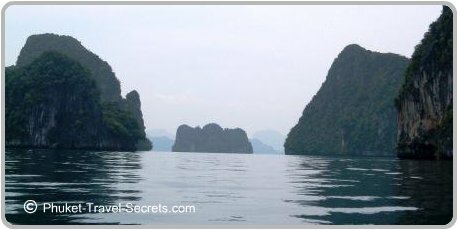 Our day trip to Koh Hong, started relatively early, leaving Ao Nang by longtail boat around 8.00 am and arriving at Hong Island an hour later to find that we had the whole island to ourselves, apart from the National Park Rangers. We were in heaven, it was such a fantastic experience to be able to explore this magnificent island, basking in the sun, swimming and snorkeling before any other day trippers arrived. Day trippers and tour groups started to arrive around 11.00 am, and it began to get a little crowded. So we decided to move on to our next island adventure, but before we did our longtail boat driver took us to Hong Islands main attractions a secret room called a “hong”. The Hong is a large lagoon surrounded by tree covered cliffs. 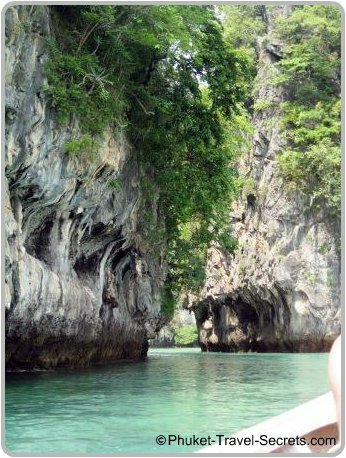 Access to the lagoon is through a narrow opening in the rock formations, it is only accessible by kayak, or longtail boat when the tides are right, allowing you to swim around in the clear but very shallow waters. Other eco activities and fun things to do at Hong Island include snorkelling and scuba diving, fishing, hiking and kayaking, relaxing or just admiring the superb views. 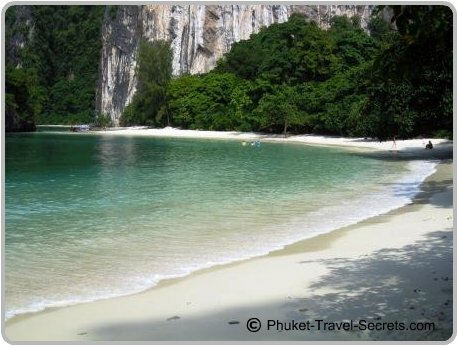 Ko Hong and the smaller Islands are one of the best and most popular tourist attractions in Krabi. The National Park Ranger Station is located on Hong Island and visitors are required to pay a 200 baht National Park fee. 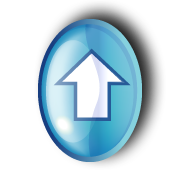 There are camping facilities available, although you will need to bring your own tent. 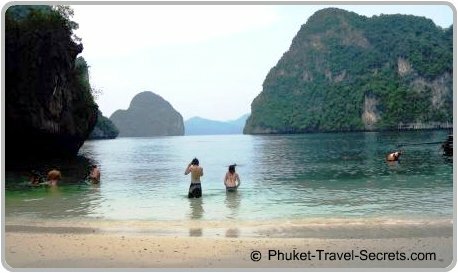 If you take a day trip to Koh Hong, check to see that the National Park fee is included in the price of the tour. Facilities at Hong Island include wooden tables and benches where you can enjoy lunch under the shade of the trees. Kayaks are also available for hire from the booth located just behind the beach and most importantly toilets. 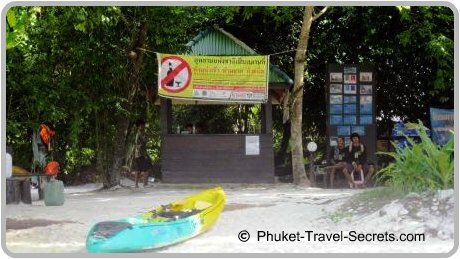 As Koh Hong is National Park, smoking and drinking or selling alcohol on the beach is not allowed, however there is a designated smoking area just near the National Park Booth. After leaving Koh Hong our next stop was Pakbia Island and Rai Island where we just chilled on the beach and relaxed in the calm waters. On low tide you can walk across the sand bank to Rai Island. Just offshore is a deep coral reef, and one of the best spots to go snorkelling. Our last stop of our island hopping adventure was Lading Island also known as Paradise Island , from the main beach you have spectacular views across the seascape. The best time to visit Hong Island is early in the morning before lots of day trips and speed boat tours arrive, take plenty of water, lots of sun screen and a towel. The quickest way to get to Ko Hong is by speed boat, however a longtail boat is so much more fun. 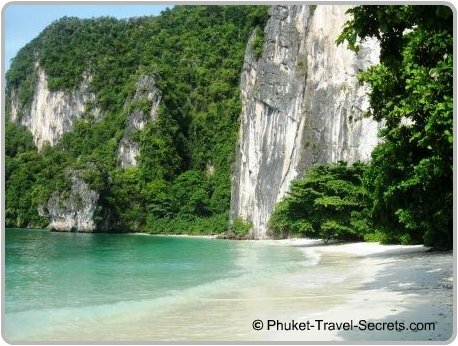 You can book day trips and tours to Ko Hong from tour operators, travel agents or at most hotels in Krabi. If you would like to book tours we have found Easy Day Thailand to be a reputable and reliable company. As we were a group of four, it worked out cheaper to hire a boat and a driver for the day. We negotiated a good price which included pick up and from our hotel, snorkeling equipment, National Park fees and a return transfer back to our hotel direct with one of the local longtail boat drivers, at Ao Nang.